Camping is available on a first come basis also. The camping season is April through October and campsites may be rented nightly, weekly or monthly. There are 62 RV sites with electric and water. Approximately half of the sites have sewer hook-ups and a dumping station is also available. Many tent sites are located in the center of the campground. We have a small store on the ground to purchase ICE, BAIT, or SNACKS. Please respect nature and dispose of wrappers and other trash appropriately. All boats put on the lake must pay a launch fee ($4.00). The is no size limit on boats, but the entire lake has a NO WAKE SPEED--which is strictly enforced. Rental boats are 14' jon boats with oars and may be rented daylight hours only. If you have your own motor, you may use it on a rental boat. If you do not have your own life preservers, they may be rented from us. Senior Citizens may rent boats for 1/2 price on weekdays. All fishermen MUST have a Kentucky State Fishing License. Fishing is allowed with rod and reel only. Common fish species caught are largemouth bass, bluegill, crappie, and catfish. State regulations are enforced. Licenses can be obtained at sporting goods stores such as Wal*Mart and Cabela's. Rowdy and disorderly conduct will not be tolerated!! Our season is from April 1st to November 1st. 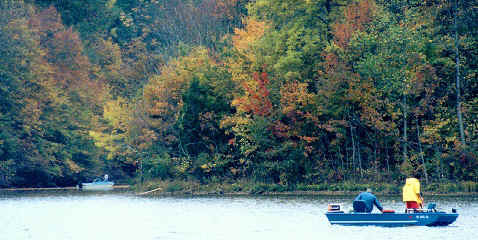 The campground closes November 1st, however if weather is nice, we are open for daytime fishing. If you have any other questions, you can reach us at the Lake Jericho Ticket Office at (502) 743-5205. We also have a yearly membership (for daytime use only) that covers a husband and wife, their own children under the age of 16 and launch fee for 1 boat. The only way to be here after dark is to pay the camping fee and be in the campground area. All entries MUST BE BEFORE DARK, after dark the gates are closed. These camping rates cover 2 adults and any children under the age of 12, with a limit of 6 people per campsite. If you have your own boat, you can be out on the lake at night time. In the late 1950's, recurring flooding damaged thousands of acres of cropland in Henry and Trimble Counties. The town of Sulphur was underwater and many homes were lost. The Henry and Trimble County Conservation Districts worked with the Fiscal Courts in each county and the Soil Conservation Service to develop a project that would protect residents in this watershed from future damage. A board of directors was formed from landowners within the watershed to oversee the activities. Chairman, John C. Foree Jr. Under SCS's PL-566 program, five flood retarding structures were installed throughout the watershed for a cost of $1.7 million. One of those structures, Lake Jericho, was also designed as a recreation area. The largest of the five lakes, Lake Jericho covers 136 surface acres and is open year round for fishing, camping, picnicking, etc. Around 40,000 people visit Lake Jericho annually, which produces close to $100,000 revenue each year. The recreation area has a full-time manager who is supervised by the watershed board. In addition to the income from Lake Jericho receipts, the Conservancy District receives revenue from a mileage tax imposed on land within the watershed that helps operate and maintain all five structures. The Little Kentucky River Watershed Conservancy District is comprised of 8 members, 5 from Henry County and 3 from Trimble County. The board is a sub-district of the local county conservation districts. The Little Kentucky River Watershed Board of Directors meets monthly to review activities occurring within the watershed. All meetings are open to the public. This site was created by Joyce K. Meyer, on October 26, 1997.